At CCS Property Services, we provide water emergency removal, damage, and cleanup services throughout all of Northeast Wisconsin and the surrounding areas. Water emergency damage can happen at any time and our team of experienced technicians is available to help you with our 24-hour emergency services. It’s important to extract the water as quickly as possible and start the drying process to minimize the damage. We will work with your insurance company to restore your property. Failing sump-pumps, broken pipes, and/or seepage are many of the culprits for water damage in Northeast Wisconsin that we receive. These items mostly cause flooded basements. It’s best to create a routine and check your sump-pump on a regular basis. 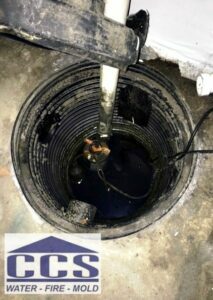 Sump-pumps tend to give out when they are needed most and proper maintenance can be the difference between life as is or water damage in your home or business. Next, keep your home in proper working condition and check your pipes for loose seals or any types of cracking in the pipes. Even small leaks can turn into something much larger. If the unfortunate happens, like a flooded basement, know that our technicians are ready to respond to any type of water or sewage damage. Call us at 920.435.2288 for any water damage that has occurred in your home. We understand the devastation you feel when you’ve been hit with a water emergency and are here to help you. At CCS you can count on our trained and certified professional staff to respond to your needs to clean and restore your property to pre-damaged condition. For more tips on preventive maintenance of your home, visit our blog.